These handed, carved wood and gilded Louis XVI-style garland wall lights with two lights, were made by the great firm of Leone Cei. Located in the heart of Florence, Italy since 1902, they work in ways that have not changed for over 500 years (except for the electrification). The wood is carved by hand, glue made by boiling rabbit bones is applied, a layer of gesso is put on, and then red powder, before the 24 carat gold gilding is applied. The final stage is burnishing with agate-tipped tools. They will not therefore have the (dead) perfection of something machine-made, or of metal versions of such designs. Though made (in this case) fourteen years ago, such pieces are often assumed to be antiques. They are not meant to look new. The master carves pairs (in this case, a left-right) at the same time to make sure they match. Those carved on other days will be different. E14 lampholders. Wired for 230V. Easy to rewire. Note that it looks too yellow or too silver in some shots, so I've included an image of Leone Cei's that gives a fairer representation. 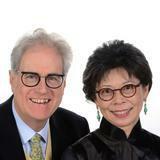 Cheryl and Peter Younie created Cameron Peters Fine Lighting in 2004 to introduce a new concept–a consultancy supporting the specifiers of international luxury residential and hospitality projects when they are selecting decorative lighting. After fourteen years of doing nothing else, they know about the lighting issues raised by all kinds of spaces, and all kinds of client. They work with around eighty brands, craftspeople and artists, so they have the deepest possible knowledge of fine lighting suppliers – their collections, and their strengths and weaknesses. The Company has drawn on this experience to introduce its own lights, the Cameron Peters Collections. They believe that there are far too many lights in the world so, if they are to introduce yet more, there has to be a very good reason for each one. These first collections are intended to create work for European craftspeople working at the very highest level (Murano glass and English Crystal) whose livelihood is under threat through lack of demand. Cameron Peters Fine Lighting therefore teamed them up with prize-winning specialist designers. The brief was to create exceptional lights that would appeal to a discerning international audience – and be irresistibly beautiful. 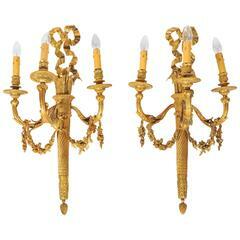 A good quality pair of French gilded ormolu Louis XVI style wall lights. Having arrow sheath, ribbon, swag and foliate decoration. A very impressive large pair of French, Louis XVI style gilded ormolu wall sconces, having classical ribbon and bow decoration. 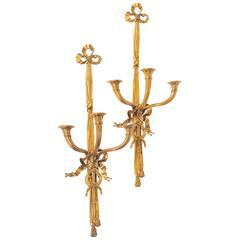 Pair of Louis XVI style gilt bronze wall lights, each one of typical form fitted with two newly wired candelabra bulbs. 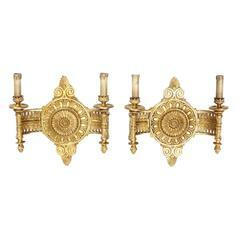 Lovely pair of Louis XVI style gilt bronze wall lights. Perfect in an entryway or flanking a mirror in a powder room.